We would probably score a lowly ’10’ on a 0 – 100 cool scale. There are certain barriers to coolness; age, wealth, comfort and attitude amongst a multiple of other obscure and meaningless measures. If you rock up on a beachy outcrop in a 1960’s CamperVan full of surfboards and cook on an open fire you will be oozing cool, whereas, your half million pound Motorhome with drive-in rear garage containing a Mini Cooper will have the exact opposite effect, especially, if like us, you are 40+. We would, however, happily live a life of uncoolness if you handed us the keys to a half million pound Motorhome. Also, the occupants of the 1960’s CamperVan look great as they play guitar watching the sunset draw an end to the day, but, as a million gallons of condensation cascade them through the sliding door in the morning they paint a different picture, huddled under a damp blanket looking like sleep is a distant memory waiting two hours for the open fire to boil a pan of water for that first brew of the day. There is some hope for us, the ‘mid-cool’ ground of the modern high top, high specification CamperVan or Motorhome. Generally equipped with decent heating, cooking appliances and owned by non surfing, non guitar playing oldies like us. This lifestyle attracts us and we find ourselves looking at these vehicles more than caravans at sites or shows. Not that we don’t like our caravan, we absolutely love it. Each vehicle type has its own benefits and restrictions. This is why we are now contemplating owning both. On this year’s 50 day European ‘Caravan’ Tour we pitched up on thirteen campsites, enabling us to settle in, get comfortable and start exploring the surrounding areas. Effectively, you pick an area and become the hub of a wheel, each day travelling down a different spoke visiting interesting sites, all in your car, no caravan in tow, no height restrictions, easy parking and decent fuel economy. On the negative side, between each of the thirteen sites was an average four hour drive towing the caravan past countless towns, spectacular scenery and interesting locations with the words “If only we could just stop” or “We will have to stay here another time”. If we had toured in a CamperVan it would have been a totally different, albeit slightly less comfortable, tour. We would probably have had thirty or more different sites, moving on every day or two days capturing every location to see along the given route, avoiding motorways and toll roads, pitching up at the side of an Alpine view or beautiful lake, often for free. The reduced fuel efficiency would be offset by sightseeing on route rather than driving down each spoke of the caravan base wheel. There is something very liberating about travelling with no plan and a vague destination, but to some people it may feel you are always travelling and never reaching the destination, a caravan pitched for two weeks in the sun may feel like a proper holiday. With no plans to sell the caravan and no money to buy a Motorhome we are now exploring the option of buying a van (Transit Van style) and completely self building/converting into a CamperVan. We don’t even have the money to do this, so selling the main car and downsizing the house features large in our latest plan. The idea of a self build appeals very much, knowing every inch of the van and building to our own design would be perfect and foster a real bond with the vehicle, not to mention, save about £20-£25k on the price of a new manufactured CamperVan. Picture courtesy of backpackinglikeaboss.com – one of many online blogs following the step by step journey of a van conversion and beyond. Even more could be saved if we braved a second hand van but we dislike the ‘wheel-kicking’ process so much that we try to buy vehicles new then run them forever. The Boss has a formula, every £1k of purchase cost should deliver us a year of ownership, so vehicles generally get a minimum of ten years with us and almost always reach the £1k = 1 year requirement. 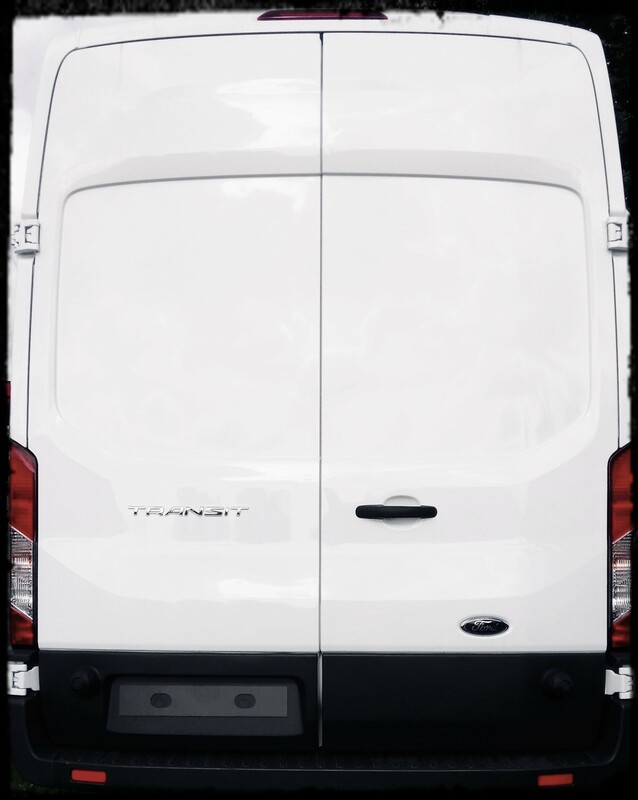 So we will keep you informed, not if, but when we sell up/downsize and buy a van. Will we know what we are doing when we start the conversion? Er no, not at all, but by the time we have asked lots of people lots of daft questions and googled some bits and bobs, we will… and trust us, it will be a tidy job. … but we will still cast the occasional envious eye at the really cool CamperVans driven by those Surfer types. We are in the same dilemma. We fancy a motor home but still want to keep the caravan. I don’t mind the thought of a panel van but OH not so keen. Guess we will all have to keep saving and doing the lottery. Tee hee. I so enjoyed reading this. 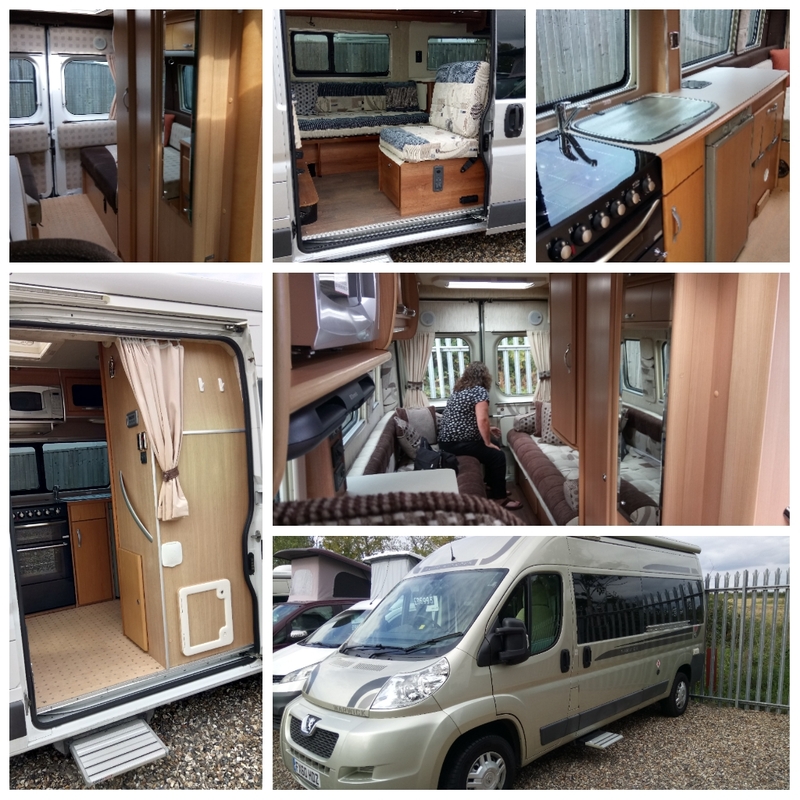 We agonised so much about whether to buy a camper or a caravan – the heart said Camper… in the end, for us, we concluded that a caravan is just not cool… but It met our particular needs in every other way! When we stop touring full time, we think that we might get a van conversion with which to tow the caravan – then we’ll have the flexibility to take the van for weekends and short breaks, but still have the caravan for comfort on longer trips. I’ll be looking forward to seeing the process evolve, and the van (when purchased) turning into a ‘camper van’. We’ve spent quite a bit of time in the UK. People that tow caravans around those crowded roads, and through villages with hair pin bend curves in the roads, well – you all amaze me. It makes us appreciate the relatively uncrowded, and relatively straight, long roads in Australia. Good luck with raising your ‘cool’ rating – maybe get an old acoustic guitar and paint a few daisies on it, then strum a few bars as the sun sets…. Thanks Chris, it will happen as we have to downsize anyway. We will recoup some purchase cost by using van to move house first. I tried guitar once, I even remember ‘D’ and `G’ chords, I could start a punk band. Maybe I just turn my back and mime to a Jack Johnson CD, oops showing my age, a Jack Johnson download/stream. Great writing. You have captured the pros and cons and the search for that ideal. While loving the idea of self-build we certainly don’t have the skills or patience for it but I think it takes you much further up the cool scale:-) We love owning a campervan and do move on a lot but occasionally stay three or four nights somewhere and you can always take the van out for the day as stuff is soon packed away. Sometimes we only move 50 kms between sites! Exciting times for you. Keep us informed. Will do, seeing people like yourselves touring abroad in vans does make us a tad envious, except when the van goes for a short tour of its own though, not so envious then!!! Interesting!! We looked into camper options last year & were flabbergasted at price of them (Leisuredrive is round corner from us). So we also priced getting van & conversion which would save a small fortune. There are some excellent (and no doubt some dodgy too) companies who will do conversions for you – an option we would be forced to do as no spare time to do ourselves & experts can have it done whilst I would take forever!! We decided not to go down that route, mainly because we don’t fancy having to use camper/van for everyday use. Nipping to shops & parking in cartain places would be a nightmare. Comparing the Base cost of a new van to a brand new Campervan conversion there does seem to be a massive ‘mark up’ in the region of £25-£35k. I think they are selling ‘a dream’ to people reaching lump sum pension age. Whereas, for us folk wanting the dream before the lump sum – a bit more frugal creativity is required. That’s a kind offer, thank you, we may ask a question or two when we take the plunge. I guess the hard part is when you start cutting holes into your new van, but yes, plenty of determination helps. 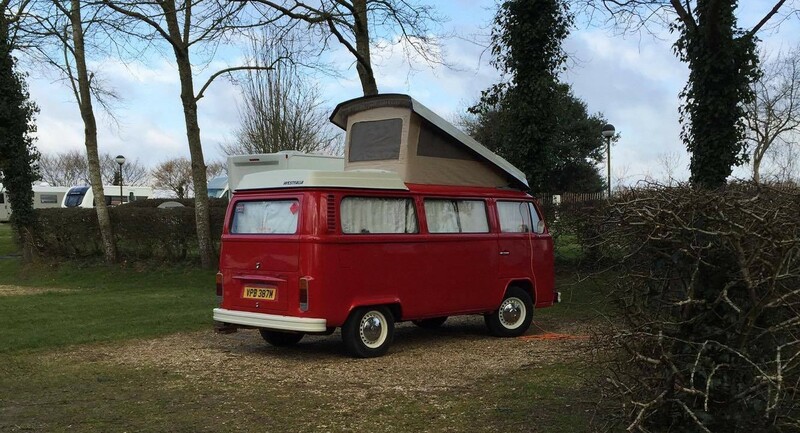 I think 60/70 is a cool age to start VW campervanning, tell him to make you one!